Within Glenelg House, you will find a selection of modern, fresh and spacious bedrooms located within three discreet wings. 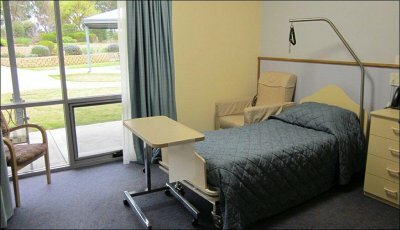 With a choice of single or shared rooms residents are able to relax and feel at home knowing that every room is designed for comfort, safety and security, all with contemporary trimmings including large LCD televisions and central heating and cooling. Each room includes a spacious individual or shared ensuite bathroom which is fully equipped to provide for every resident’s needs. Rooms have direct access to spacious outdoor gardens providing residents with both personal and private space in their rooms and shared outdoor activities. 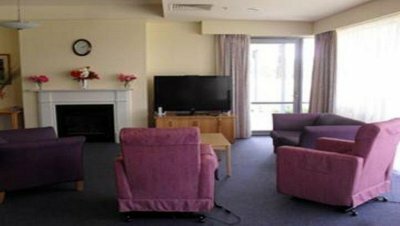 Glenelg House provides three large, open lounge areas for residents to enjoy, each comfortably furnished with individual recliner chairs, settees and opening onto generous outdoor garden areas. 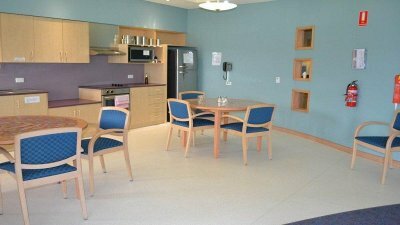 Each lounge area has its own large screen TV (LCD) and includes a dining area with kitchenette, from which all main meals can be served should the residents wish. The dining rooms have the capacity to seat 12 people. Sweeping gardens provide space to stroll and relax whilst only a short distance to the town centre where an array of shops and local businesses boast every convenience. 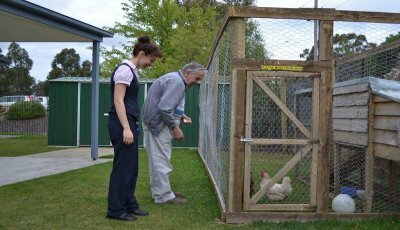 In addition, for your peace of mind, Glenelg House enjoys a private and secure outdoor area that incorporates courtyards, gazebo, barbeque facilities, established trees, manicured gardens, vegetable patch and a chicken coop. All staff are fully trained nurses and events/activities programs are conducted by qualified staff. Personal laundry Y – Onsite daily service. Other service arranged as requested at residents costs i.e. dry cleaning etc.